Even if July's Incredible Hulk movie does better than expected, there's no way it'll do as well as Iron Man, the Robert Downey Jr. film that looks like this summer's Transformers. But the green world-beater's lack of supremacy isn't just due to all the reasons people have cited: less impressive effects, slower buzz, creative spats. It's also just because Iron Man is relevant to today's world, and the Hulk isn't. 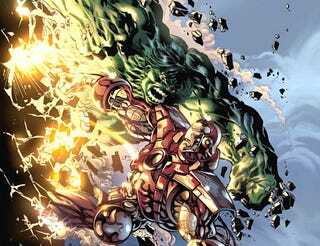 Both Iron Man and Hulk hail from the height of the Cold War, but Iron Man's origin is easier to update than the Hulk's, in a sense. At his heart, Iron Man is about war, and about the United States supplying weapons overseas. Tony Stark is a weapons manufacturer who gets into a jam in a foreign country, where he's arming U.S. troops and their allies. He gets injured and captured by a local warlord, who tries to force him to make weapons, and instead Tony creates the first version of his Iron Man armor, which he uses to bust out. In the original version, Tony's war takes place in Vietnam, and the local warlord is named Wong-Chu. But it could be any war where the U.S. is working with local forces: Somalia, Bosnia, Haiti, Afghanistan, Iraq... The U.S. will always be involved in a war somewhere, as long as we're a superpower. The Hulk, by contrast, is like Godzilla: he's all about the bomb. If you've only seen the TV show or the Ang Lee movie, you might not realize how much the Hulk's origin ties in with nuclear bomb testing. In the comics, Dr. Bruce Banner is a repressed nerd who creates the most destructive bomb in history: the Gamma Bomb. He's about to test it, when he sees a teenager has sneaked out onto the test grounds. Bruce manages to rescue the teenager from the blast (by getting him into a magically protective trench) but catches the full brunt of the explosion himself. Miraculously, Bruce doesn't die, but instead starts turning into a big green (or occasionally grey) rampaging monster. Despite the fact that we still have enough nuclear warheads to destroy the entire world a zillion times over, and loose nukes are still a huge problem, people don't worry about nuclear destruction as much as they used to. It's no longer hotwired into the zeitgeist the way it once was. And that may be why people always leave the bomb out of the Hulk's origin when they retell it. (Actually, I think the TV show left out the bomb just because it would be too violent and disturbing to show Bill Bixby transfixed in the glow of a mushroom cloud.) Instead, you always have Bruce sitting in a chair and getting bathed with Gamma radiation, or injecting it into his arms, or in a big chamber of Gamma rays or whatever. It's all about laboratories and irresponsible experiments, instead of nukes. Bottom line: no matter what you do with him, the Hulk is no longer a metaphor for something that freaks us out, and Iron Man is.